The special thing about five guys is that the food is specially prepared front of you so you get to see how it is all done which i love the aspect of it but all the people working just looked like red ants to me. I tried both the Veggie Burger and the Salad and was sadly not impressed both times. When i was down in London one of the places that i really wanted to visit was the New Five Guys burger joints that has recently pop up all over London. All the blogger were raving about it and my london friends as well would not stop raising it praises. Now i dot know what i was expecting but it certainly wasn't this.In the end i actually went to two five guys in the space of two days to try and give it a fair rating. One in Kingston and the other in Convent Garden. I have to say i wasn't really impressed with the place. As you can see the second time i went i was actually given a plain salad with grilled cheese on top. I mean come on guys do you not even care for vegetarians. I know its a burger place but come on!!! There were some redeeming factors though such as the complementary free monkey peanuts which i loved and could not get enough off plus the delicious fries that i had. Now if you go there please just get a little since the regular is honestly big enough to actually feed two people. The fries are close to being some of the best i have ever had. 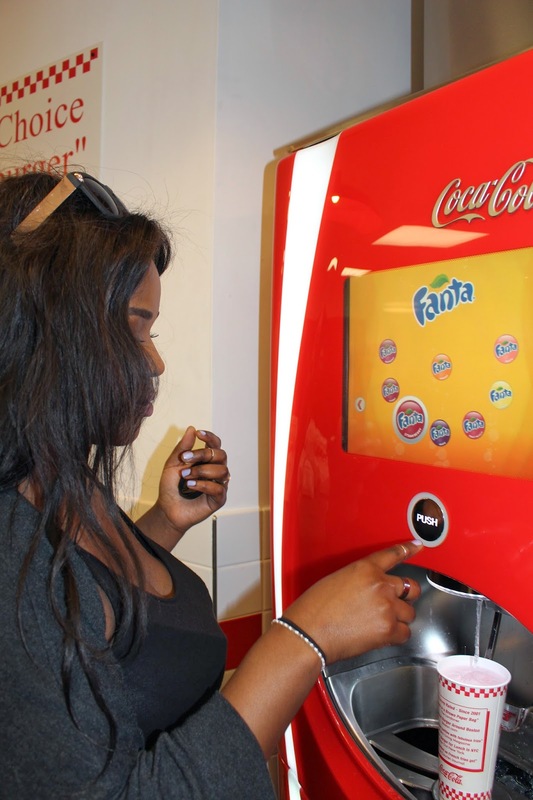 Now i am not one for fizzy drinks but i love my Fanta and it was nice getting to try out all the different fanata flavours and i had fun mixing them up.